August 24, 2012 – a day that will live in the annals of feline history forever. It was the day that a human travelled across the ocean to meet his feline muse. The human was a Lithuanian composer/conductor by the name of Mindaugas Piecaitis. 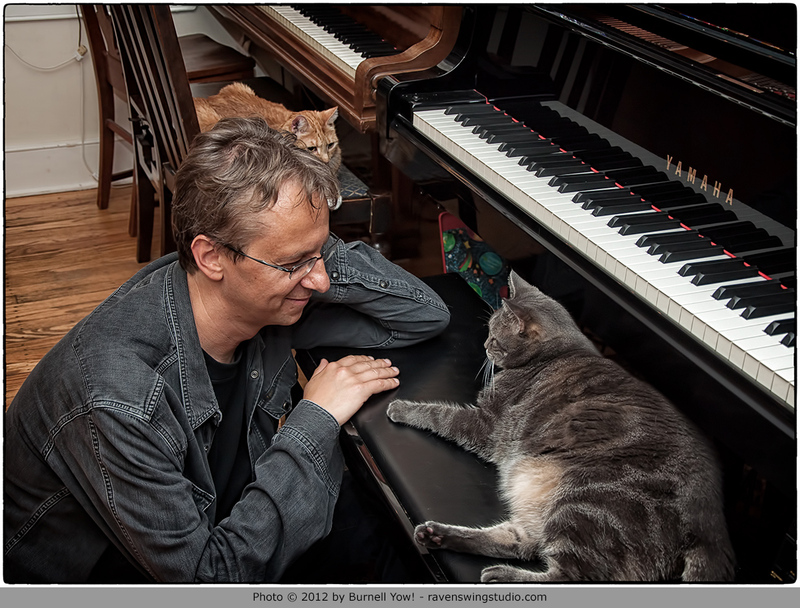 As my many fans, friends and admirers know, Maestro Piecaitis is the composer of CATcerto – a concerto inspired by the piano stylings of yours truly, Nora The Piano Cat. This wonderful piece of music was written and conducted by Piecaitis and performed by the Klaipeda Chamber Orchestra. I, of course, was the guest soloist and appeared via a pre-recorded video projected onto a large screen behind the orchestra. The concerto went on to be published by Peters Publishing and has been performed, to date, twenty times in five counties since it’s premiere in 2009. The video of the world premiere in Lithuania has been viewed several million times on YouTube. All this and still I had not met the composer face to face. All that changed on August 24, 2012. Later, during our three day visit, I played a bit more and he displayed a few playing techniques he had learned from watching my videos. He’s working on mastering the head roll. I felt honored and humbled. When he left, I felt sad but also very happy we had had the time to share some very special moments. And I’m certain we’ll meet again. Wow, what a magical meeting! Such a special story, so happy you were all able to meet. Nora you are still one of the most precious things I have ever seen. By the way how did the other kitties take to the Maestro? All the others loved Mindaugas. Especially Rennie. Mindaugas stayed in the art studio while here, and slept on the sofa bed. Rennie lives in the studio, so he was very happy to have someone spending several nights there. What beautiful pictures those are! How precious! Thanks for sharing! How wonderful, Nora! Maybe this visit will inspire another composition. Maestro Piecaitis is a lucky man to not only visit you, but stay with you, the other cats and your humans. This is amazing. I am glad I followed this blog. This cat is so precious! Little Nora is a sweetheart. I look forward to every update…especially new pictures! I was thrilled to see your performance. 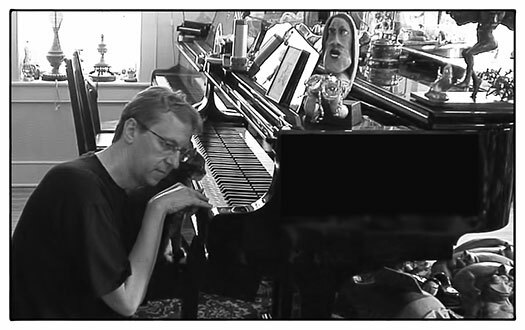 I must give Maestro great credit for his ability to weave such beautiful harmonies around your composition. Your talent is superb. 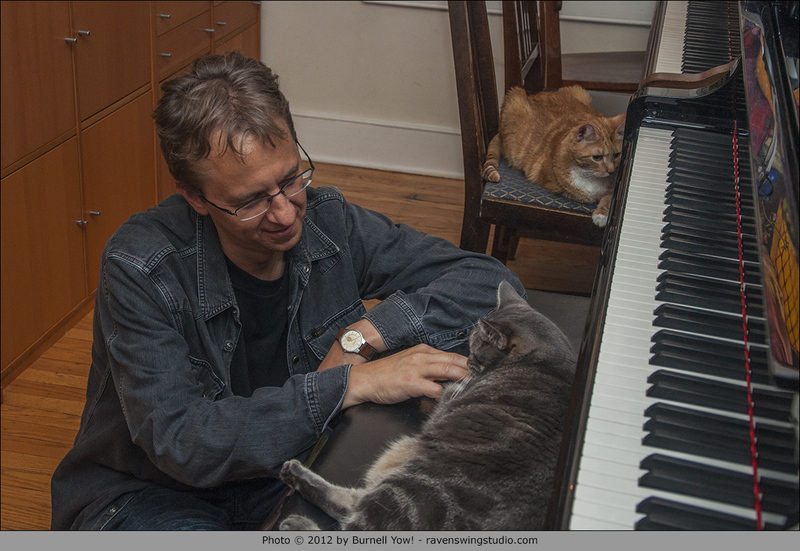 I hope each of my four cats will appreciate your wonderful musical abilities. I am now (73) taking piano lessons, but am nowheres as talented as you. Would you consider giving me lessons? Thank you, again, for this wonderful gift you have given us. You have lifted up cats all around the world.